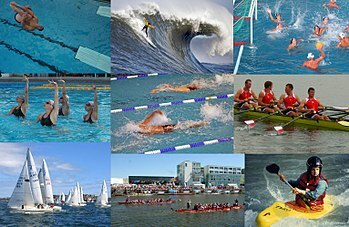 "Water sport", "Watersport", "Water sports", and "Watersports" redirect here. For the sexual activity, see Urolagnia. Artistic or Synchronised swimming is a hybrid of swimming, gymnastics, and ballet. Water polo is a sport of two difrrence teams played in water with a ball. This page was last edited on 23 April 2019, at 14:53 (UTC).